Symphony Enterpriseshelps client realize the extensive benefits of SAP by discovering ways to optimize existing system functionality, eliminate inefficiencies, and tap into business intelligence and analytics for increased transparency into business operations. 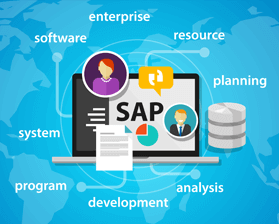 We help our client to maximizetheir SAP investment with our global delivery, which deliver a flexible and reliable IT infrastructure, optimized for SAP applications, with the ability to implement new technologies, tools, and methodologies to drive profitable growth. Our strength at Symphony enterprise has always been that we are able to help our clients in niche areas, providing consultants that most other firms can’t. One of the toughest areas in which to find consultants is Hybris. The immature nature of the consultant market means we must rely on the hard work and talents of our recruiters and sales professionals to understand where the technology is headed and find the best professionals around. SAP Hybris is essentially the cloud version of SAP E-commerce, just as SuccessFactors is to SAP HR and Simple Finance is to SAP FI. Independent, top-tier, Hybris professionals are a rare commodity – but this is exactly the kind of market that Symphony excels in. Our unparalleled research which maps Hybris talent pools, clients and major implementations, coupled with our outstanding relationships with Hybris professionals means that Symphony can provide the Hybris expertise you need, when you need it.